The powerhouse over the past several seasons in the Western Conference has been the Oklahoma City Thunder. Last season they went all the way to the NBA Finals but met a Heat team on another level, it wasn't their time just yet. 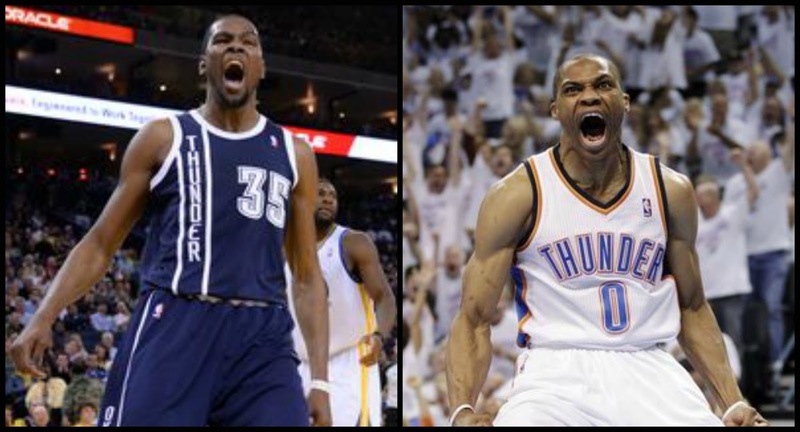 A big deal has been made out of the whole Russell Westbrook/Kevin Durant. Many people don't like Russell taking so many shots and would like to see KD get more aggressive on both ends of the floor. I can fully understand why people would say that but when Durant has a season where he shoots 40% from behind the 3-point line shoots 50% from the field It's kind of hard to argue that point. 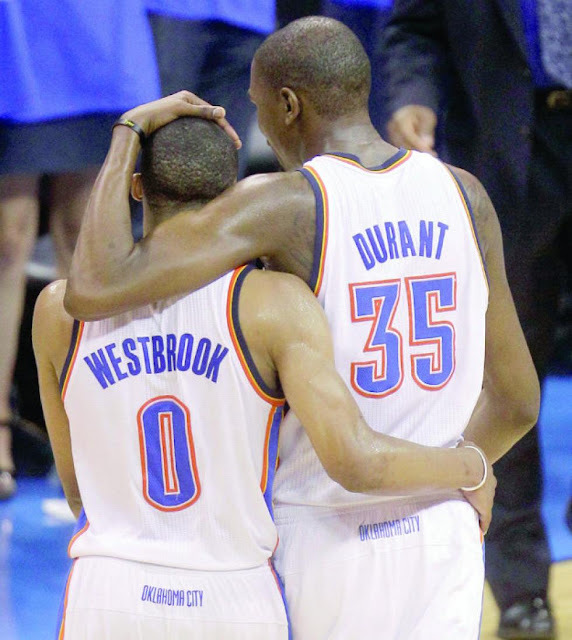 Westbrook and Durant are polar opposites on and off the court. Westbrook plays with an aggression and is one hundred miles per hour all the time. Durant is much more smooth and calm and has a tendency to just go with the flow. The opposite personalities led the Thunder to the#1 seed in the Western Conference. If the Thunder want to win a ring then These 2 need to be the best players for the Thunder throughout the Playoffs, consistency is key. 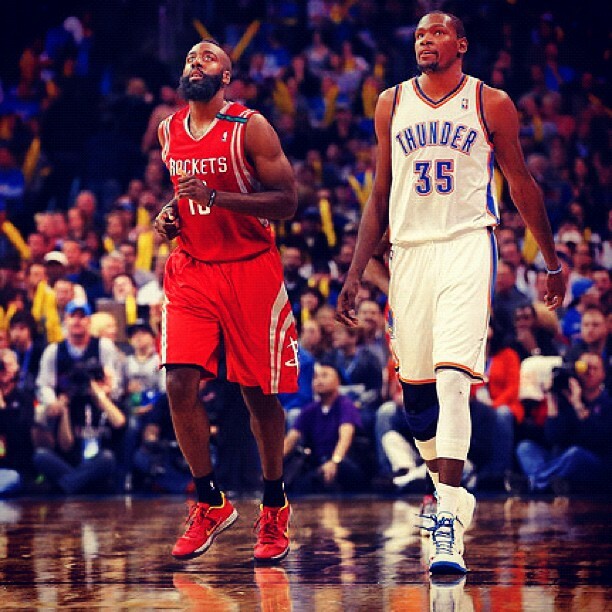 The 1st round in OKC's Playoff run matches them up with an old friend-James Harden and the Houston Rockets. Last season Harden was a part of that OKC team that went all the way to the finals in a 6th man role. Prior to the season Harden was trade to Houston where he would make more money and be the guy. He is the face of the Rockets and now as the playoffs begin he and his friends from Houston will take on Westbrook, Durant and the Thunder. This series has that interesting story lines and I'm sure it will be fun with so many exciting players to watch. The leaders of the Thunder will need to take care of business early and not give the Rockets any Life. They have proven they are elite but can OKC finally take the next step and become Champions? 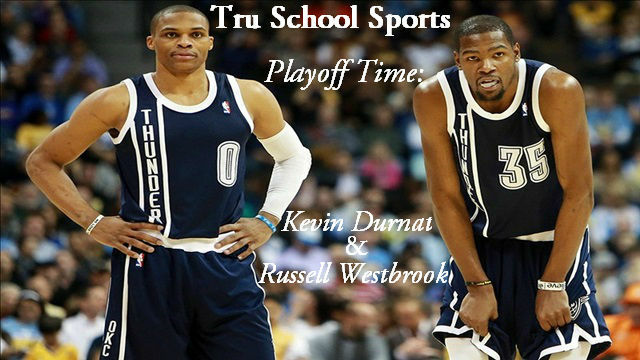 The NBA playoffs begin April 21st for the Thunder as they take on James Harden and the Houston Rockets.